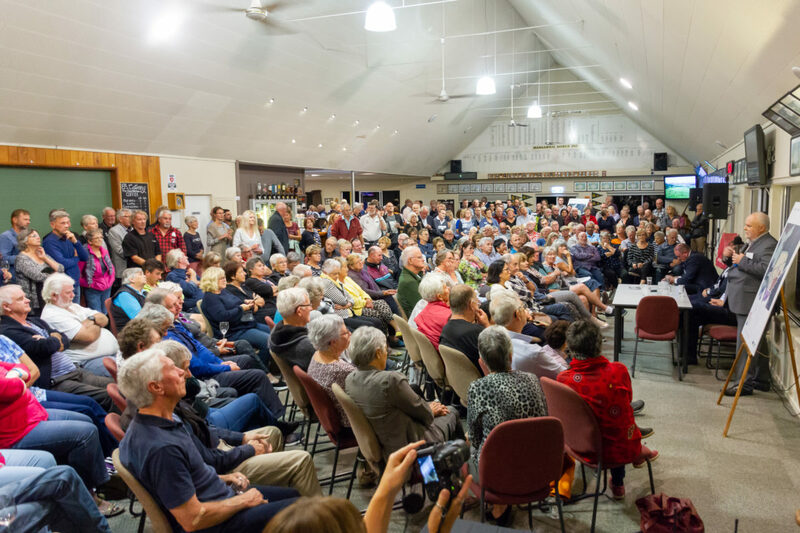 A long-awaited second meeting regarding one of Mangawhai’s intriguing developments was attended by hundreds of residents recently, eager to hear the latest news and progress. More than 430 locals gathered at Mangawhai Club on April 27 to get an update from developing company Viranda, for the areas proposed new township, Mangawhai Central [MC]. Company co-founder and chairman, Andrew Guest, along with members of the technical team engaged the crowd, explaining the ongoing progress they had made in the 10 month gap between meetings, and answered a myriad of questions from residents. Bayleys North owner and director, Mark Macky, who was involved with the sale of the MC property, opened the meeting welcoming and thanking everyone for taking the time to come, saying how great it was to see such ‘an active community who want to have a say in how this wonderful part of the world evolves’. Kaipara mayor Dr Jason Smith, deputy mayor Peter Wethey, and Councillor Jonathan Larson were also present, stating their role was to gauge the community’s response to the ‘new fresh-start vision’ of the project, with Smith also pointing out how the MC planning design resembled the shape of Mangawhai’s namesake and icon, the stingray. To a round of applause, Andrew Guest confirmed Viranda has settled the land, are fully committed to the project and affirmed MC is a community project, led by the community, for the community. He also stated the meeting was a discussion and not a presentation of what will be. Guest also confirmed monthly workshops will be advertised for community consultations regarding the design process and the MC website will be updated with current information available. He hopes to hold regular public meetings with the next possibly scheduled for August. A range of questions were asked from the floor, with the community interested in a variety of aspects including roading and traffic flow, financial effects of sewage, water availability and potential facilities such as a medical centre and schooling with one resident asking what kind of supermarket might be built, to which Guest answered, ‘first the community has to decide if they even want a supermarket’. Questions were also raised about the possible effects of MC on Mangawhai’s current two townships, the Village and the Heads. Guest reassured residents the he recognises the importance of maintaining the character of both places. Deputy mayor Peter Wethey also answered saying that as MC is a project with a gradual build, the continual growth of Mangawhai will absorb the development. Applause was also given for Viranda’s gesture of good will to the community, by seeking out and gifting funds to help with local organisations Mangawhai Surf Club, Mangawhai Museum and Mangawhai Activity Zone’s ongoing projects. Although an exact time for the first earthworks could not be determined ‘in a perfect Sunday’ Guest says he would like to think machines could start laying out some initial roads in the next development season, October 1st. However this depends on the community agreement of the project and council due process.